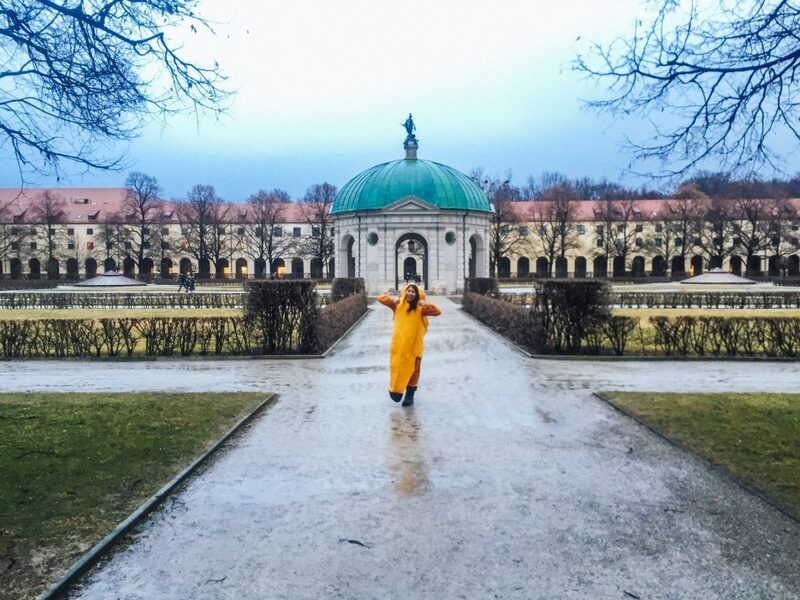 It’s 2pm on a Tuesday, and I’m strolling through the streets of Munich in a banana suit. There are times when I do really question my life decisions, and no doubt, this was one of those times. Now, before you assume I had some kind of mental banana suit breakdown, let me inform you that there was a reason for my fruitlicious garb. 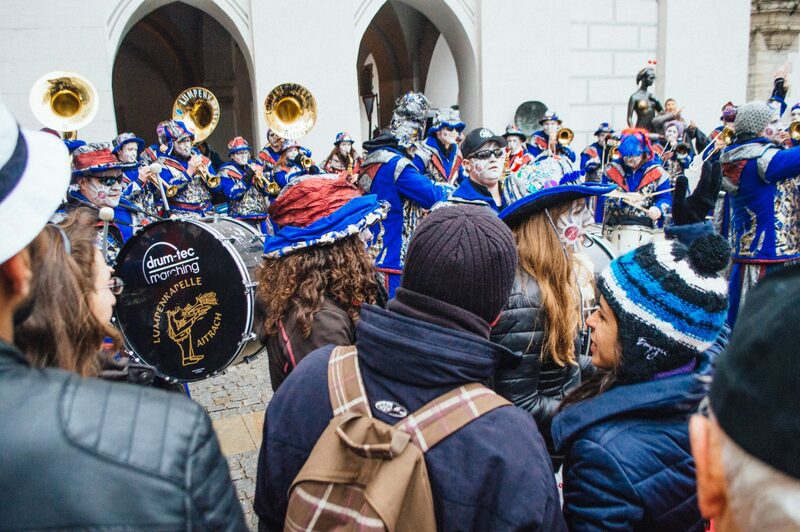 One of the best things about living in Europe is the many reasons to celebrate and have fun, and this past Tuesday (recognized as Fat Tuesday or Mardi Gras elsewhere in the world) was one such example of mad celebrations at their best! I mean, with Lent about to begin, it’s a common occurrence that good boys and girls get together and unleash all their madness before giving something up. 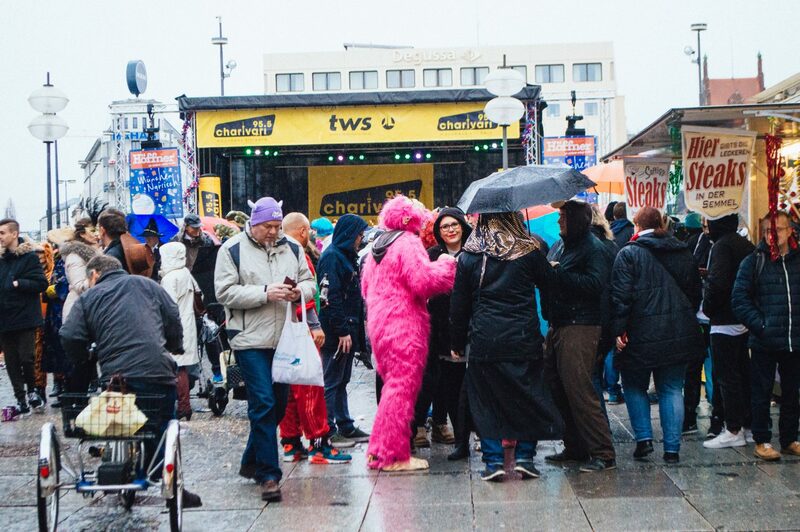 In Munich it’s called Fasching, elsewhere in Germany, it’s Karnevale… Carnival in Brazil, etc. etc. No matter how you name it, it’s a fun excuse to get out, be ridiculous and have a good time. It’s serious stuff though: Bavarians even get a half-day at work for the occasion! 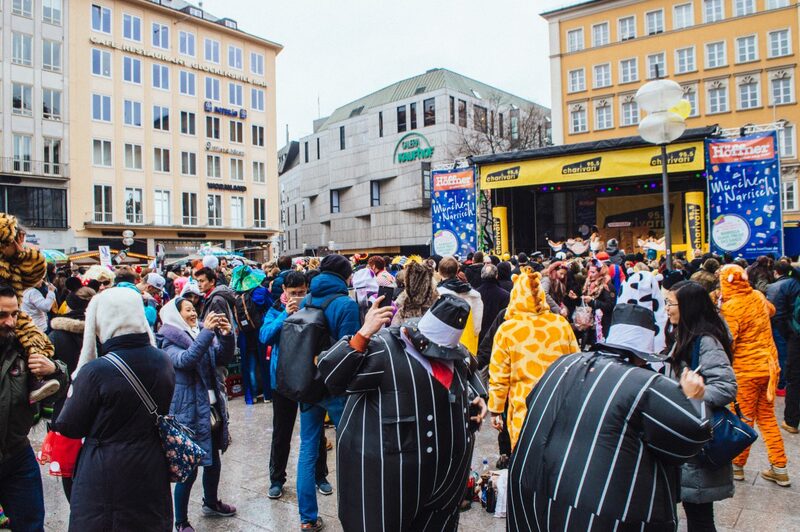 So, eager to get in the Fasching spirit, I zipped up my teddy bear onesie, layered on my floppy ‘too long for me’ banana suit, and clasped the hand of my boyfriend, dressed up as a tropical version of Frozen’s Olaf. 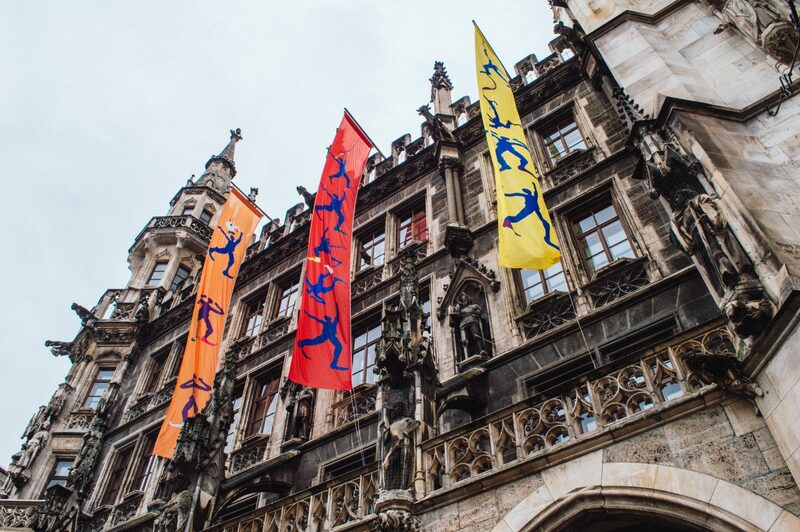 Our plan was to visit Munich’s main square, where we heard there were tons of stages, festivities, dancing, etc. happening. 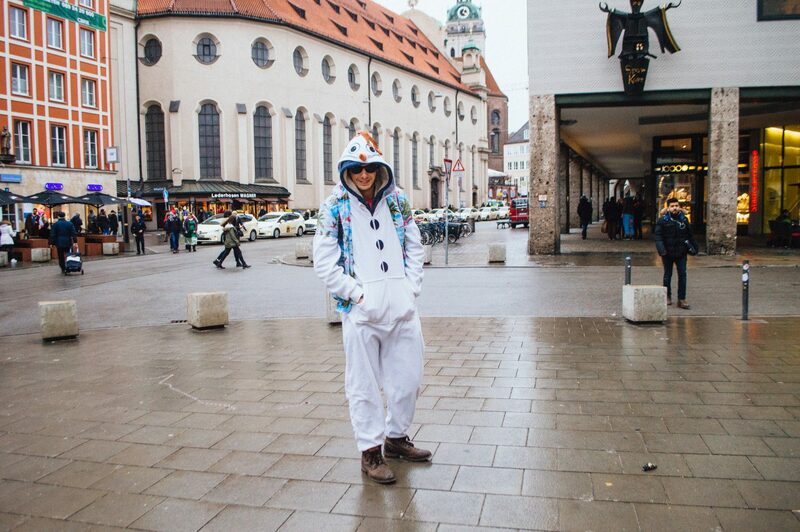 With a 15min trek to Marienplatz, we couldn’t wait to get out and see everyone’s vibrant costumes and onesies! My mind was dancing with images of all the awesome party photos I had seen from the year prior, and I was certain the streets would be abuzz as soon as we stepped out. And so, the banana and snowman hit the town. … and there was nothing. Well, besides some judgemental German frowns, there was nothing. Even as we crossed into Old Town, through the (usually lively) Hofgarten, we didn’t see a single soul dressed up. We were 100% sure we had somehow gotten the traditions or dates mixed up, and were already thinking up an escape route that would minimize our public humiliation. We had found our people! Despite a shaky (and paranoid) start, we got to Marienplatz and finally found the party. The weather might have been grey and soggy, but the next few hours were an absolute blast. Even better was the fact that there were all these traditions that we had no clue about, which made things all the more fun. From the many kids aggressively throwing confetti (AT us, by the way) to the red-faced partiers hollering German hits that I didn’t know the words to… it was all in all, a pretty wonderful way to spend a Tuesday. We ate crepes, chowed down on Hungarian langos, bobbed in the crowd during a bunch of musical performances and in true Bavarian fashion, drank plenty of beer. 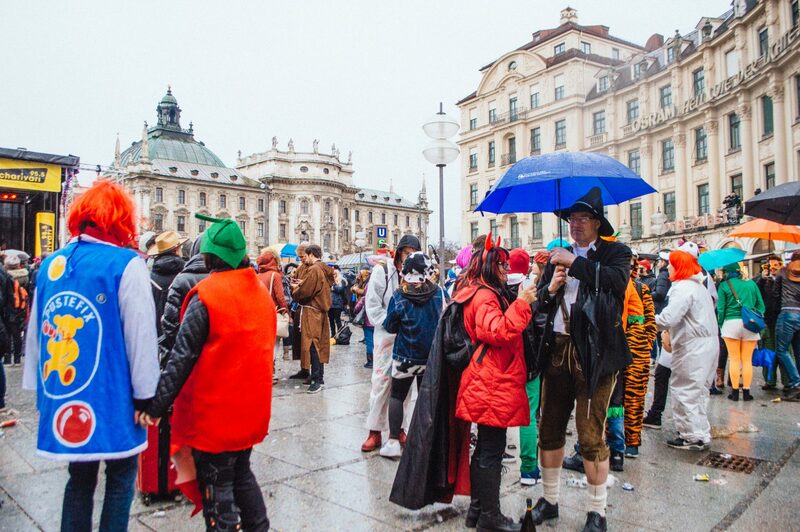 The periodic rain and dreary Munich grey didn’t seem to deter anyone from being their craziest selves. I even got stopped for a few photos, because clearly I’m one irresistible banana. Maybe one day I’ll make it to the big Karnevale celebrations in Cologne or maybe (let’s dream big), even Rio! Until then though, I’m pretty happy with my first Fasching experience. In fact, I’m already brainstorming the costume ideas for next year…! Do you have any suggestions for me? 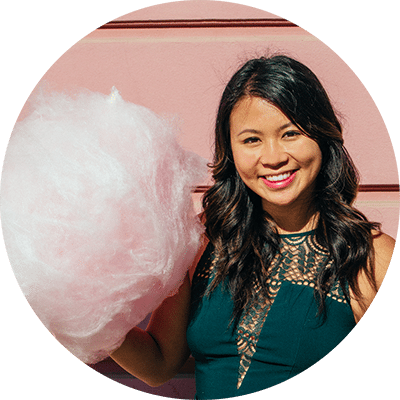 much love from Christina, the blogging banana. Looks like so much fun. You achieved celeb status for sure. Love the banana suit! I like how you went all in with the banana, no wonder celebrity status and pictures with others! I think carnivals are meant to be all in, if you dress up, there shouldn’t be a confusion if you are wearing a costume or not! Enjoyed looking at the pictures, as I have been to Munich airport a dozen times, even this year, yet never outside, so a glimpse of what I am missing every time! You’re so cute! This looks like so much fun. In San Francisco we always have a few costumes in the closet ready to pull out at a moment’s notice. There is nothing San Franciscans like more than a good theme party, and the entire city gets together and celebrates. Whether it’s Halloween, Bay to Breakers (which you would LOVE! HUGE street party, SO much fun. I mean, it’s also a marathon, but that’s mostly irrelevant), Folsom Street Fair, one of the many themed bar crawls, Pride, or any other excuse to dress up, you’ll hop onto the train to go into the city and the entire train is filled with people in costumes. 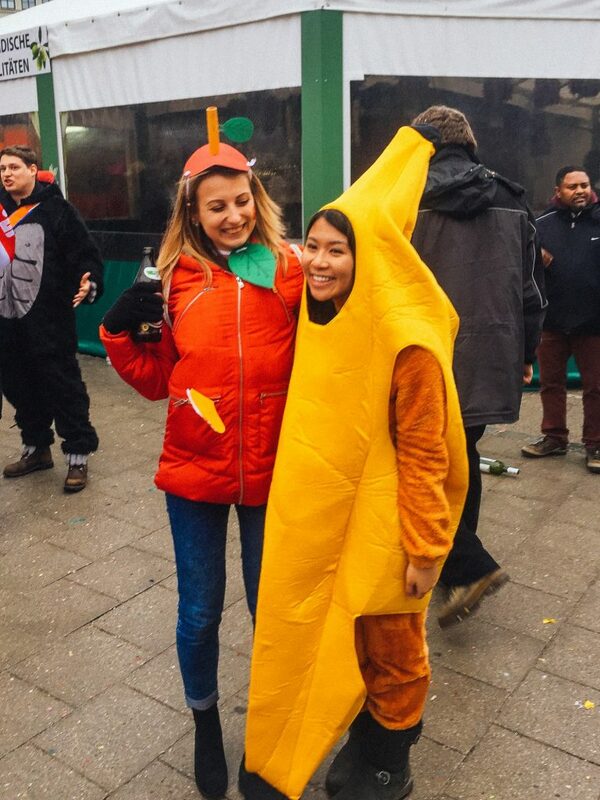 It’s the opposite of your photo walking down the empty streets in your adorable banana costume 😛 You’d love it! You should add Bay to Breakers to your list … I’m slightly biased but I totally think it’s up there with Carnaval, hehe. Ha ha ha! I work for a German company from Munich and I’ve heard my colleagues had half of day off for this, but I guessed people were a bit more fun, maybe it as because of the snow. Your costume sure was hilarious! Love your costume! 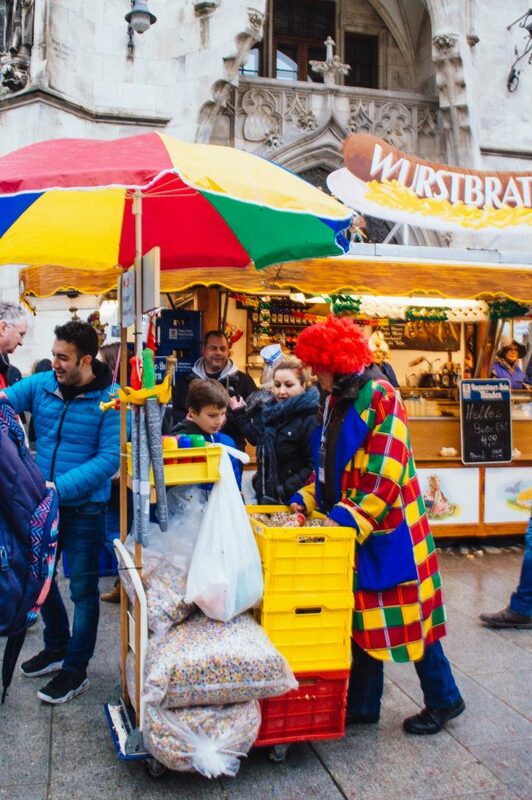 I went to Karneval in Cologne a few years ago… it’s a funny festival. I love cultural celebrations like this! Hilarious post! <3 <3 Thanks so much for the love!! This is awesome! I think I need to come over to Germany and hang out with you Christina, you have so much fun! 1. I would love to know where you bought your costumes. 2. 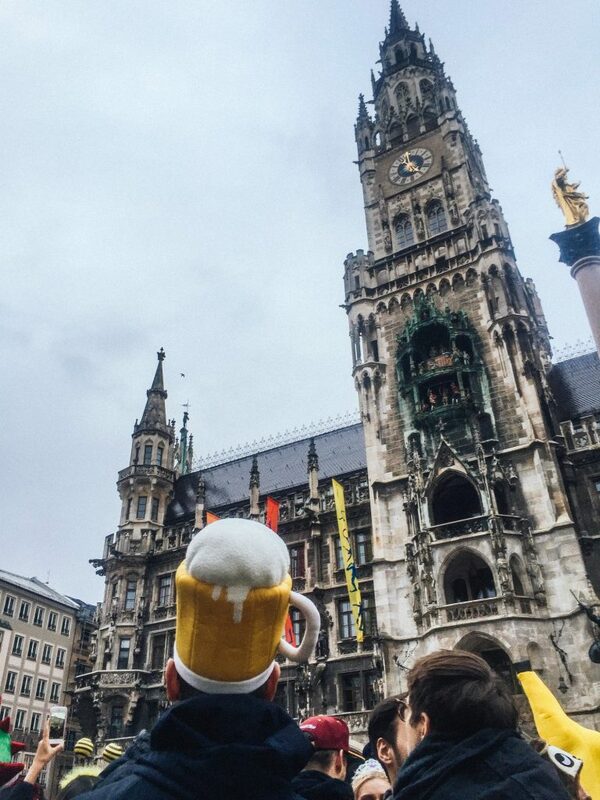 In one of your pictures, I see a man wearing a beer stein hat. I love that. Can you let me know how I can buy such a hat. I think it would be a huge seller here in the states. 3. It would be great, when you give us pictures, to have a caption to tell us the name and some informationabout the buildings. For example, in one of your blog pics above you say: Where is the party at. There is a huge building right behind you. What building is that? Hey Bud, thanks for reading! 1. 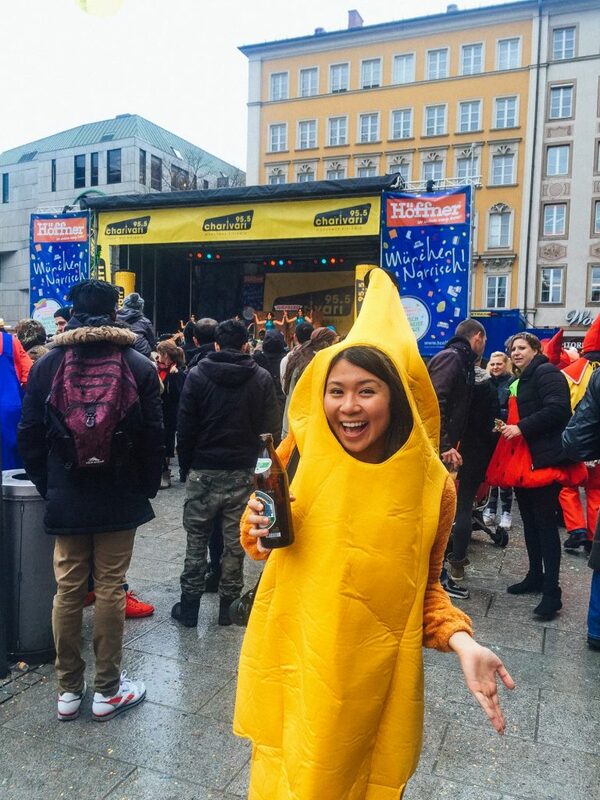 I got my banana suit at a 2nd hand shop in Munich called ReSales and my boyfriend got his onesie from Primark (I believe) in the UK. I’m not sure where that hat is from because that guy was just a stranger haha but I assume you could probably get one online quite easily. Thanks for the feedback re: captions – I’ll definitely change them once I get a chance but in that particular photo with the ‘where’s the party at’ caption, that was taken in Hofgarten, the garden right behind Munich’s Residenz Palace. Hope this info helps !